This entry was posted in Полезно, Програмиране on 08.07.2016 by admin. Lightweight: Only 7.8KB, one file included. Easy: Extremely easy to learn and use, friendly construction. Powerful: Support various common SQL queries. Compatible: Support various SQL database, including MySQL, MSSQL, SQLite and more. Free: Under MIT license, you can use it anywhere if you want. This entry was posted in Програмиране on 04.10.2013 by admin. Тук може да намерите 23 демонстрации на различни Слайдери/Карусели, с и без присъствието на jQuery. This entry was posted in WebMaster, Програмиране and tagged carousel, jquery, slider on 12.28.2011 by admin. 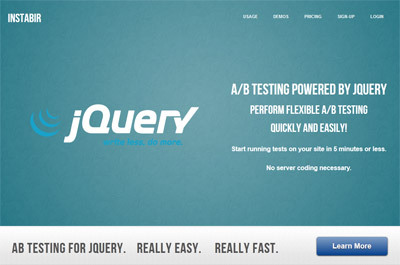 This entry was posted in WebMaster, Програмиране and tagged ab testing, jquery on 12.21.2011 by admin.